BEND, OR (Monday, May 22nd, 2017) People’s palates change with the seasons and we want to adapt with you. GoodLife Brewing is excited to announce Secret Stash #003 is a refreshing Blood Orange IPA that is 6.5% and 60 IBU’s. We brewed Secret Stash #003 with Comet, Mosaic, Idaho 7, and Cascade. We didn’t want to stop using hops there, so we then dry hopped it with Galaxy and Citra. Secret Stash #003 has a burnt orange/golden color, slight haze, and a white head. Subtle citrus and blood orange notes on the nose combine well with bright citrus flavors finishing with subtle bitterness. Re-fermented on blood orange puree and lighter in alcohol at 6.5% ABV, this is a refreshing IPA with a playful palate. 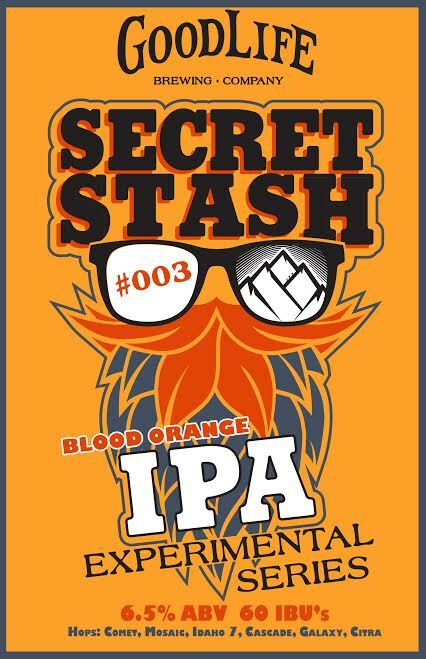 Secret Stash Experimental IPA Series will be available in draft (1/2 BBLS and 1/6 BBLS) only throughout Oregon, Washington, and Idaho with limited volume so make sure you find every Secret Stash!